We are the first supplier in the world to offer dry cabinets with Humidity and Temperature internal monitoring. 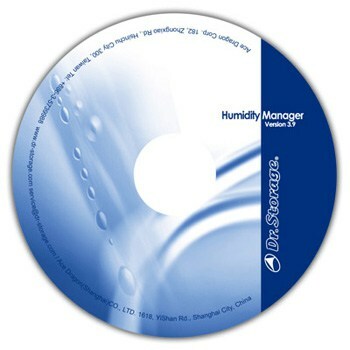 Our Humidity Manager Software (version 3) allows the dry box user to be aware of the storage condition over a period of time, and records that data. The software does not follow the device, it is associated with the internal dry box condition, and comes with most Dr Storage dry boxes at the time of purchase, at no extra charge. Our Humidity Management Software comes free with all Dry Cabinets featuring an RS232 Port. So if someone opens the door to the dry box, it is records the corresponding exposure of RH level, of all the devices internally. Although Humidity Manager software does not follow the device(s) individually (we have another software package that does this called Humitel) it does make it much easier to calculate the floor life of the MSD using Humidity Manager V3. Frequently, customers estimate floor life and sometimes needlessly bake components because of uncertainty. If exposure is not greater than 12 hours, a minimum desiccating period of 5X the exposure time is required to dry the SMD packages enough to reset the floor life clock to zero. For moisture sensitivity Level 4, 5, 5a with floor life exposure not greater than 8 hours,a minimum desiccating period of 10X the exposure time is required to dry the SMD packages enough to reset the floor life clock to zero. H/T Data acquisition: can acquire data directly from the dry box controller with RS232 cable or from Data Logger & Reader. Data interval can be set from one second to 99 minutes. Software runs under windows operating system. 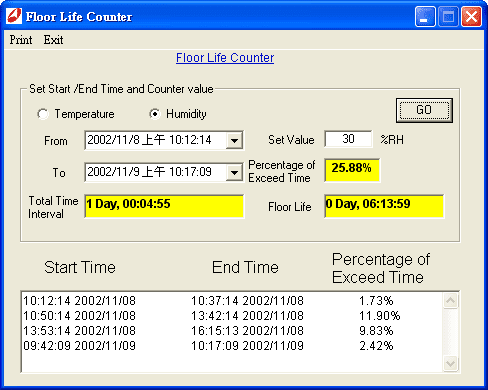 Automatically calculate the time intervals and percentage that exceed the 10%RH or 5%RH which leads to the estimation of the MSD floor life. Automatically calculate the total period and the expired date of the Data Logger. 1.) According to IPC/JEDEC J-STD-033B standard. For moisture sensitivity Level 2, 2a, 3 with floor life exposure not greater than 12 hours, a minimum desiccating period of 5X the exposure time is required to dry the SMD packages enough to reset the floor life clock. 2.) For moisture sensitivity Level 4, 5, 5a with floor life exposure not greater than 8 hours, a minimum desiccating period of 10X the exposure time is required to dry the SMD packages enough to reset the floor life clock.